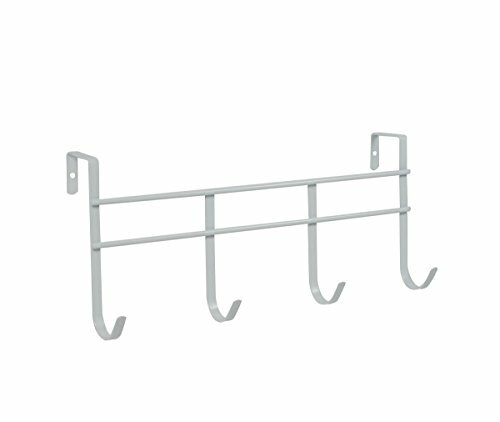 Add storage to any room in your home with the Over the Door 4-Hook Rack by Spectrum. Take advantage of unused space behind any door in your home by hanging a variety of items. Perfect where space is limited such as dorm rooms, apartments and small closets, it's great for hanging hats, coats, towels, robes and more. With no tools or installation required, the sturdy steel bracket fits doors up to 1-5/8'' thick and comes predrilled for optional permanent installation. Measures 3.50"Depth X 13.75"Width X 6.25"Height. Cabinet shelves may obstruct cabinet door from properly closing when item is used. Please measure in advance of purchase. If you have any questions about this product by Spectrum Diversified, contact us by completing and submitting the form below. If you are looking for a specif part number, please include it with your message. Presa PS41002-50PK Ps4100250Pk Metal Peg Board Shelving Hooks (50 Pack), 2"